‘Umami’ is the fifth taste. Not sweet, sour, salty or bitter, but ‘umami’ – a Japanese term that translates as ‘savoury pleasure’ or ‘mouthfeel’. And while this perfume by Florascent – a German fragrance house that apparently uses only natural essential oils – is not conspicuously gourmand nor notably edible, there is a certain texture or heft in this scent that is more than liquid; a soothing, binding, moisture-absorbing quality that is very comforting, particularly when it starts to get cold and even you yourself need binding. The main theme of Umami (which I bought as a new winter perfume recently from Charis, my favourite aromatherapy shop in Fujisawa, the city where I work), is tonka bean (a warm, nutty, coumarin-drenched aroma), fused with black pepper, a dry, unsaturated sandalwood, and a pleasingly gentle, unsweetened vanilla. Chewy all-spice; ginger and a barely discernible osmanthus form the heart, while the all too brief top note of Japanese yuzu gets rapidly subsumed in the self consuming warmth. It has to be said that there is not a great deal of development in this perfume – what you smell in the bottle is pretty much what you get on the skin – but I was pleased I bought it. Perhaps the closest comparison I can make to Umami is Guerlain’s Heritage, which in the rare to find eau de parfum used to comprise a stunning and enduring note of black pepper in its blinding initial stages, over a gorgeous, heady, male blanket of tonka, vanilla and a smooth, delectably oriental base. But while the Guerlain, as you might expect, was luxuriant, fluffed up, recherché, Umami is more…….. huggable (really, very huggable), particularly on a freezing winter’s day. An arran sweater lacking drama, you might say. But somehow that is what I liked about it: it is a completely dependable, go-to scent that never really raises its voice, so to speak, but stays tucked up and taut – and that’s somehow exactly how you want it to be. Have you tasted the Umami laden toast spreader called Vegemite? No, but I did just have our version, Marmite, on toast for breakfast! I think that rates as Umami too? I adore Umami, and your description is spot-on. I love the umami concept, and that combination of dry and sweet in this perfume really is cozy. I used to work in a shop that briefly sold the gorgeous scents if Florascent, but now they won’t export them to the US. They are the only natural line that smell and act like actual fine fragrance. I have been very concerned with the known toxins inperfume and cosmetics, and have been on a mission to avoid them and spread the news, but have fallen off the wagon – so to speak. I have always adored perfume, and cannot deny myself the pleasure! If you get a chance, try Pipapo and Tango as well. Tango they didn’t have, but Pipapo I was planning to review as well; I wouldn’t wear it myself, but I think it is a wonderful, rich tapestry of woods and flowers that has that same ‘binding’ effect psychologically. VERY soothing indeed, without the sometimes annoying requisite ‘sultriness’ that you get in the parfums boises. I don’t understand “umami”. I understand what you mean by a mouthfeel or texture, but I don’t know umami is specifically. I am deprived. I associate richness in perfume with a kind of moist seamlessness, whereas this definitely is dry, I would say. Dry and hot. Love it! I don’t reckon, because it exists in foods you already eat and like, but perhaps wouldn’t label them that way. I would have to research more on the topic to say more specifically, but mushrooms, for example, are umami I think. Naturally-brewed soy sauce is a dependable and easily understandable source of umami. 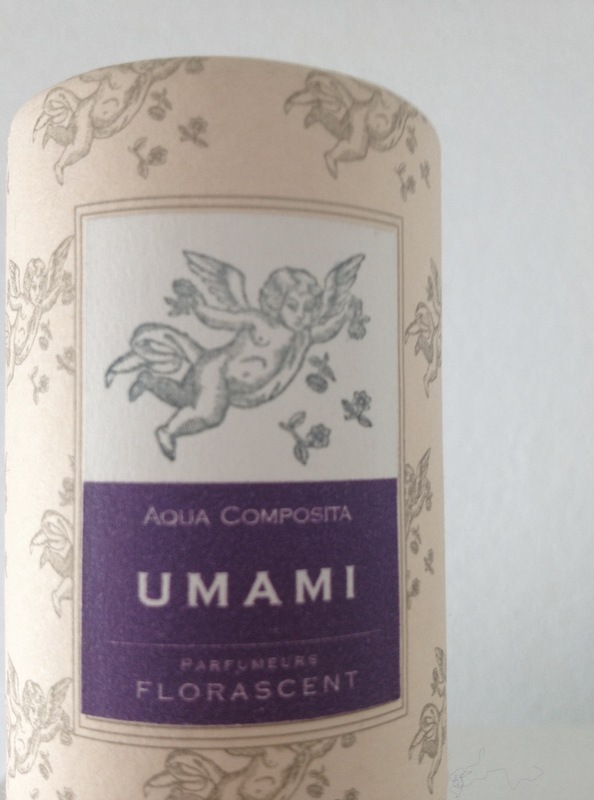 Umami, the fragrance, sounds very loveable. Nice piece, Neil. I like just simple comfort scents sometimes with no psychological edges! For sure. And nothing too intellectually challenging neither!